Men also take an interest in grooming and improving their looks. They are equally worried about their physical appearance as women. Whether they are awaiting for a date or have an interview to attend, their looks play an important role as it leaves a strong opinion about their personality. One of the beauty issue that most of the men are confronting today is dark circles under eyes in men. Dark circles make you look aged and tired. They are really frustrating and annoying as they kill your looks. This hampers your appearance, personality, and confidence. The cause of dark circles is a poor lifestyle, improper diet, smoking, alcohol, stress, heredity, working a lot in front of the screens, improper sleep and health issues like allergies or sinusitis. Also with age, the skin of men becomes thin by losing fat and collagen. This makes the blood vessels under the eye more visible and results in a dark circle under the eye in men. Women can wear makeup to hide dark circles, but for men the condition is much worse, unsightly and annoying as they mostly do not wear makeup. There are many serums and eye creams available in the market claiming to reduce dark circles. But their results are not as effective and long lasting as natural home remedies which are easily available in your kitchen and are cost effective. This article will introduce you to natural ways to get rid of the dark circles along with lifestyle changes you need to make. Green tea bags– They are rich in antioxidants. Take two green tea bags. Steep them in a cup of boiling water for 15 minutes and keep them in the refrigerator. 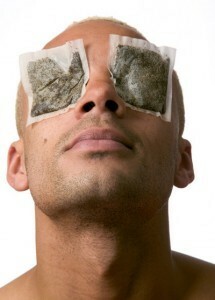 After 30 minutes place the chilled tea bags on your eyes for 15 minutes. Potato slices– Potato is a natural whitening agent. Cut two slices of potato and place them on closed eyelids. You may also grind the potato to make a paste. Apply the paste on the affected area and then rinse it off after 20 minutes. Rose water– Rose water have soothing effect. Take 2 cotton balls and soak them with rose water. Place them over your eyes for 20 minutes. Lemon juice- It contains vitamin C and also lightens the skin color. Soak a cotton ball with lemon juice and apply to the affected area. Rinse off after 15 minutes. If this burns you may add honey to the lemon juice. 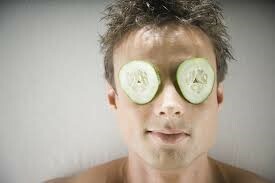 Try any of the above-mentioned home remedies to get rid of dark circles under the eyes in men. Repeat them daily for a few months to get amazing results. Take a proper diet rich in vitamins, Omega–3 and protein. Drink about 3 liters of water daily. Apply a small amount of sunscreen around eyes before going out in the sun. Do not read or work on screen in dim light. Take proper 8 hours refreshing sleep. Avoid sitting in front of the screen continuously for a long time. If you suffer from allergies or sinusitis take proper treatment.